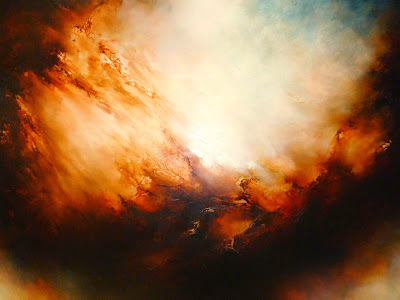 I've just completed a large abstract oil painting on canvas called " Oblivion" which is now listed on my website http://simonkenny.artweb.com . The painting measures 60 x 48", its texutred, richly coloured and themed around an apocalyptic event. I love painting these moody, dramatic abstracts as I feel I can pour out my thoughts on canvas then visualise them in reality.Its always facinating to hear what others see in each painting and I'm amazed by how diverse those opinions can be. I'm currently working on another smaller oil painting measuring 40" x 30" which should be completed towards the end of this week and I have two colour burst pieces which I'm aiming to have finished shortly after. "Oblivion", oil on canvas, 60" x 48"
To make my paintings more accessible I have a new purchase option available which may be of interest. I understand as prices increase some of the expensive art works may become out of reach to those with limited budgets so I'm trying to offer a solution which may be of some use. Should you see a painting you would like to purchase but have a limited budget payments can be made broken down in to a maximum of 4 installments, miminum of 1 payment per month accepted, maximum term of installments period 4 months. Once the inital payment has been made and cleared the painting/s will be marked as reserved in your name until the final payment has been received at the end of the agreed term. Once the balance is cleared the work will be dispatched within 24 hours. Please note should monthly payments be missed without prior agreement / arrangement a refund will be paid covering the received payments minus a 5% holding fee. The painting/s will then be re-listed as available for sale. This offer is available on original paintings only and does not include prints. Painting prices are negotiable ,within reason, as its fairly common practice to haggle a little, especially in todays market. Please understand I cannot offer discounts off paintings that are already on sale as some prices have already been reduced by up to 50%.